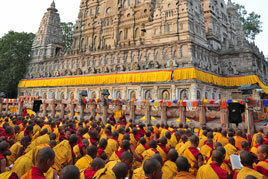 THE PRACTICE OF DHARMA involves certain possibilities. How these potentials evolve into actual situations for the practitioner, and how much is possible within these situations depends on the capacity of individual beings. 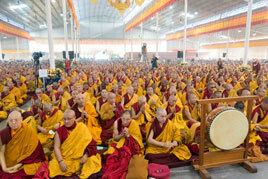 It depends upon the level of teachings that one is able to relate to, such as Mahayana or Hinayana. 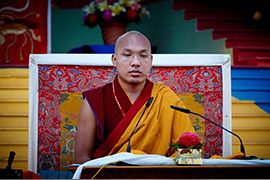 At this particular time in our lives, the practice of the Mahayana teaching is possible. It is absolutely precious and absolutely rare. 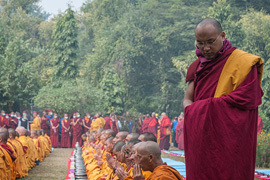 Our concern for development and our sense of responsibility has placed us in a position to integrate the preciousness and rarity of the Mahayana teaching with our lives. Through it there is the possibility of the experience of no-returning back into Samsara and the experience of ultimate bliss that is self knowing and in which there are no doubts. In the midst of the wanderings of our minds we might sometimes fall into thinking that whether one practices or not, the Dharma will always be available. If you have that kind of notion, it is a very serious mistake. Any brief moment, any time at all that one could use as an opportunity for Dharma practice, one must use. 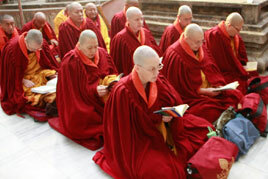 If one does not take this responsibility and offer sincere respect to the Mahayana and Vajrayana teachings, there is a definite possibility of causing harm to oneself as well as to those spiritual friends to whom one is linked. A lack of attention to the responsibilities of the Mahayana path constitutes a breaking of the Samaya principles, therefore, in whatever way one can hold to the teachings, one must sincerely do so. If you think that the teaching is negligible, such a reality will manifest because of your attitude, to your great loss. The fact is that the teaching is very much hidden from you, so you cannot really make speculations about it. On the other hand, the validity of the teaching has been witnessed by its ageless effectiveness from the time of the Buddha to this day. This is something to dwell upon. You must sincerely realize the sacredness of the teachings, to the extent of understanding that there is actually nothing more important than the practice of the Dharma within this lifetime, and in lifetimes to come. In a simple mundane life situation, in the field of 'business' we know that the businessman develops a plan for a project, he knows what it will cost him, perhaps one million dollars, and every detail of the project is regarded with the utmost care. Absolute importance is attached to such a project in the business world, and a great deal of energy is put into bringing it to a successful conclusion. The point is if one is going to expend such effort for a result of such a temporary nature, why not put at least as much effort into a project that is going to cause one's temporary as well as ultimate benefit? 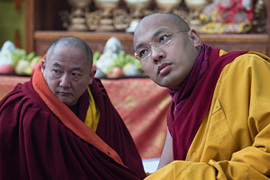 Whether you are receiving an empowerment or an explanation, if you are able to have or develop that sense of importance about the Dharma, then there is purpose in your relationship with the Mahayana teachings and there is going to be fulfillment, too. If there is a genuine commitment to the teaching, you will be able to develop direct and meaningful trust and confidence in the teachings and sincere compassion towards beings.A true understanding of the universality of the working of karma, the nature of cause and effect, will occur. The Bodhisattva's aspiration and actions are powerful because from the very beginning when bodhisattva embarks on the journey of the bodhi path he aspires to work for the benefit and liberation of all sentient beings with a very determined, definite and powerful intention. Because of the sincere resolve that is within this aspiration, whatever actions need to be performed to benefit and liberate beings are performed with great power and tirelessness. Having undertaken such a profound journey by virtue of the aspiration to help beings, as the different stages of the Bodhisattva are experienced, one finds oneself increasingly capable of benefiting countless beings. That is how the Bodhisattva first treads upon the path. When the bodhisattvas work for the benefit of all beings with such appropriate aspirations and actions there is total fulfillment. The fulfillment appropriate in the sense that there is no selfishness involved in the way of expectations, doubts, hopes, attachment or aversion regarding gains and losses of any kind. The Bodhisattva is completely pure and spotless, working incessantly and wholeheartedly for the benefit of beings. Not for a moment is there any hesitation or doubt, as these obstacles have been transcended. The ways of a Bodhisattva are gentle, since all harmful actions and indulgences have been abandoned. Not only are harmful deeds themselves eliminated in a Bodhisattva's life, but also the creation of causes of future harmful situations. Work is done solely for the benefit of other beings, not only in direct deeds, but in laying the foundations for future benefits to accrue. 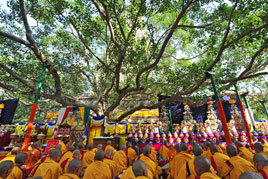 When these bodhisattvas initiate work, then, they are able to cause immeasurable benefit towards beings, and they do so manifesting fearless generosity without doubts or expectations, like the great Bodhisattva of Boundless Compassion, Avalokiteshvara, or the Bodhisattva of Boundless Power, Vajrapani, and so on. All who comprise the great assemblage of Bodhisattvas are equally powerful and equally beneficial to countless beings, so that all things seem to be at their command. Sometimes beautiful lotuses and lotus trees are caused by them to grow from the middle of the ocean, or a teardrop is transformed into an ocean. Everything in nature is at the Bodhisattva's call. Fire can appear as water; water can appear as fire. 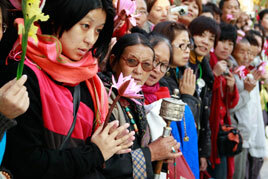 It is all because of the strength of the Bodhisattva's attitude, the aspiration and action. For us this says that the practice of compassion must be given full consideration and it must at all times be in our awareness and at all times performed. If one is going to attempt to do meditation, for example, on emptiness, Sunyata, one must never fail to relate to the enlightened objects of the Refuge on one hand, and to consistently generate genuine compassion towards beings on the other hand. The true nature of emptiness is compassion. Without the experience of the fullness of compassion, even if one claims to have realized emptiness, Sunyata, it does not have any significance. 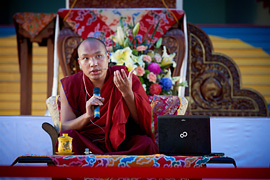 At this particular point you have the opportunity to receive the teachings. There are teachers, there are facilities. You have been receiving many levels of teachings, and it is important that you don't miss the point in terms of putting into practice what is taught. It is absolutely important. I am emphasizing today something you must have heard many times. And yet there is always the need for complete integration, for mindfulness and respect, for the treasuring of what one has understood, what one has received. 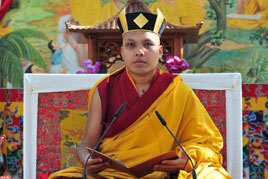 There is the need of working towards the fulfillment of the teachings and the complete realization of the meaning. And toward that end the most important factor, once again, is the practice of bodhicitta, the Enlightened Mind, by which you will gradually tread the Vajrayana path. 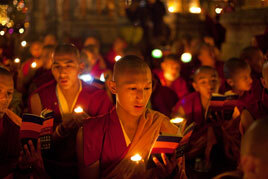 At every turn bodhicitta is indispensable. 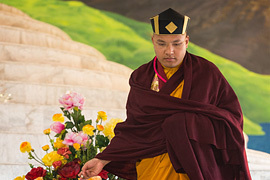 Unless the profound techniques of the Vajrayana are being supported by bodhicitta one will not necessarily make meaningful realizations. So, you see, that everything is actually rooted in the practice of bodhicitta, and to pursue with sincerity whatever enhances and supports the practice of bodhicitta creates favorable situations for its development. 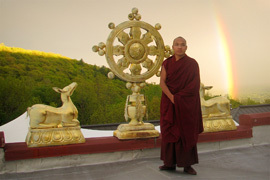 An example of a means to develop bodhicitta is Pratimoksa. In the Pratimoksa tradition there are seven families or levels of Pratimoksa, or self-discipline. 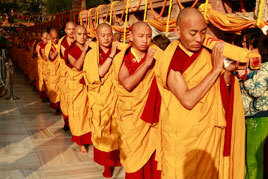 These are known as the precepts or vows. 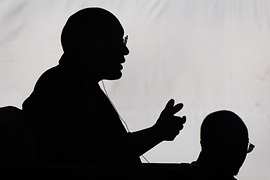 Refuge is the most important prerequisite to enter into the practice of discipline. 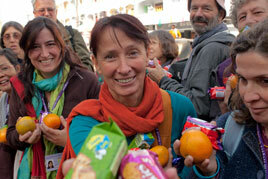 After taking refuge, you take whatever other precepts you can. Keeping them strengthens your practice of bodhicitta, and enables you to tread on the path of Buddhadharma more simply, sincerely and sanely. The importance of the application of self-discipline, the precepts, must not be neglected. Strongly ingrained are the patterns of the three poisons: aggression, attachment and ignorance. If one is to uproot these patterns and to apply the proper antidote for these poisons, the practices of discipline as outlined in the Pratimoksa are necessary tools. 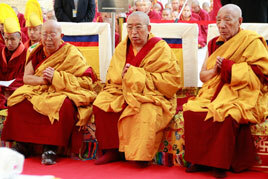 Then we have the Mahayana principles. 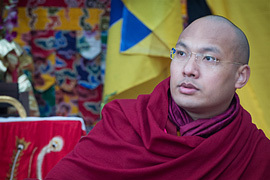 We must practice living the Mahayana ideals which we have been talking about: the development of the Enlightened Attitude, a concern for the benefit and liberation of all beings. From the material point of view this country is very rich, which means life is busier for everyone than in other places in the world, and people are occupied by all kinds of mundane demands. Because of the overwhelming material concerns that surround one, the speed of life activity increases. One busy situation leads to another, and on and on. You are constantly busy. The truth of cyclic existence is very well manifested in your lives. To remedy this state of affairs one first needs to calm down the mind. Do not be completely absorbed by your surroundings. Develop some degree of stillness. Cultivate simple control of mind, tranquility. At least some openness of the mind needs to be developed. No matter who you are, everyone needs first to relate to basic meditation practices, meditation practices that are specifically designed to bring about the calmness of the minds of beings who are occupied in such constant, busy involvement. 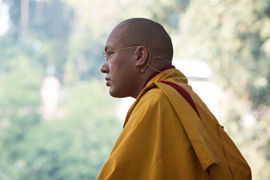 This is the first step in the practice of the Dharma, the Dharma that is so very important for oneself and for others. If you could see and appreciate the truth of the Dharma, and in the light of that appreciation continue to practice, there is no doubt about your being of tremendous benefit to the people you encounter and to this country especially. 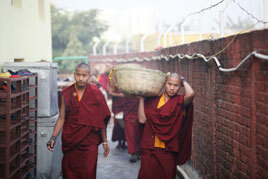 There would be no doubt about your ability to save beings from countless problems and conflicts. 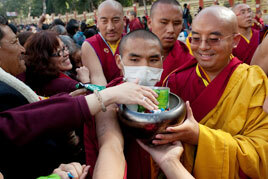 So the practice of the Dharma must be taken very seriously and done very sincerely. It plays a crucial part in shaping of one's life, and not this life alone but all lifetimes to come. If one is to have temporary as well as ultimate fulfillment of happiness, the incomparable and the only reliable connection is the practice of the Dharma. The notion of perception and perceiver has existed from beginningless time, and it is part of the pattern of clinging. 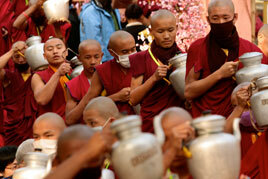 From beginningless time our shortcoming has been to fall back into Samsara. In the past, in the future and in the present, the mind has been in many ways very playful. But where the true nature of the mind is concerned, neither the color nor the shape nor the location of the mind nor its consciousness can be pinpointed. The nature of mind goes beyond all such substantialities. This being so, in the meditation practice it is important neither to invite the future nor recollect the past, but to remain in the state of nowness. The nowness of the mind is the practice which should be developed by you all. 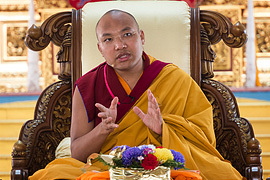 This teaching was given at Karma Triyana Dharmachakra by His Holiness the Sixteenth Gyalwa Karmapa on Sunday, August 31, 1980. It first appeared in Densal Vol. 2. No. 3, Summer 1981.